This information will be used by teachers who wish to use “0” as a custom code using SchoolLoop's Create Custom Codes option. A teacher may use any combination of numeric, alpha and special characters as custom codes. 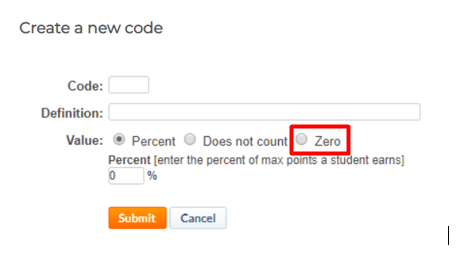 For example, if a teacher sets 0 to be 50% of the maximum value of an assignment, it will no longer possible to give any student a score of 0 that is actually worth zero points. Note: It is not recommended to use numbers as custom codes. On the Value row select Zero. (Optional) Select which percentage of the maximum value of an assigment a teacher wants Zero to represent.